GIS reduces operational costs by 60 percent. Personnel quickly embraced the technology. Customers get faster responses, and tickets are being cleared at a much faster rate. In southwestern Ontario, with the blue water of Lake Huron to the north and the sparkling water of the St. Clair River to the west, lies Sarnia, an important port city on the Great Lakes. The largest city along Lake Huron, Sarnia is also a busy border crossing between the United States and Canada. After the discovery of oil in the 19th century in nearby Oil Springs, Sarnia became a leader in the petrochemical industry. Chemical Valley, just south of the city, once adorned the Canadian ten dollar bill. Each green circle represents one mapped, official locate request received from Ontario One-Call. 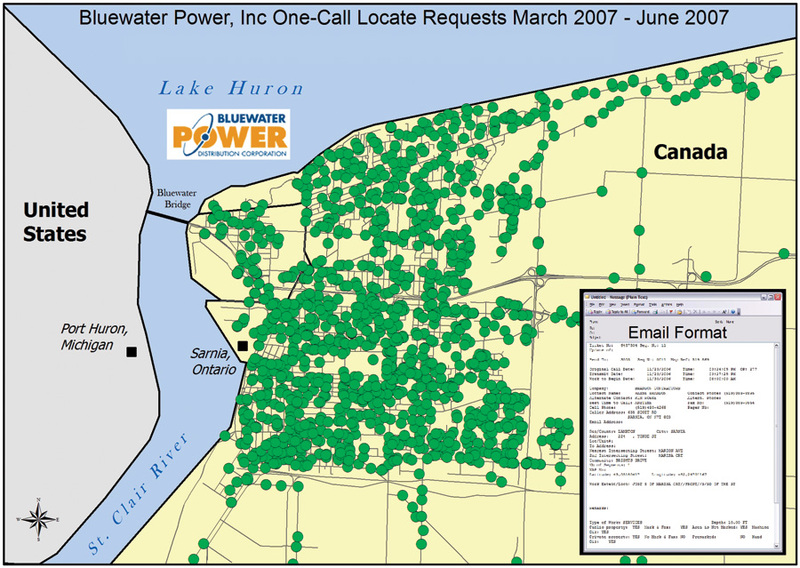 Bluewater Power now manages its locate requests using GIS. Bluewater Power Distribution Corporation has provided electrical services to the customers of this friendly city and its closest neighbor, Point Edward, since 1916. In that year, the Sarnia Hydro Electric Commission served 276 customers. Times have changed, and this forward-thinking utility has changed with them. In 1989, the municipalities of Clearwater (formerly Sarnia Township) and Sarnia amalgamated, turning over about 9,500 customers from Ontario Hydro to Sarnia Hydro. With deregulation in 2000, the distribution side of the utility underwent a name change to Bluewater Power. Bluewater Power now serves the communities of Sarnia, Point Edward, Alvinston, Watford, Oil Springs, and Petrolia, as well as Aamjiwnaang First Nations. In 1999, with an eye toward the future, Sarnia Hydro began building a GIS system, developing a comprehensive set of data layers representing the utility's jurisdiction. The project was completed in 2005. Today, the utility serves 35,612 customers, with a service area covering 201 square kilometers, and GIS continues to play an important role in the day-to-day operation of the utility. Once the GIS was implemented, the utility began to focus on ways to capitalize on its GIS investments. As any contractor or homeowner prepares to dig underground, they must first contact a one-call center (e.g., Ontario One-Call) and file a request to dig. These requests are called "locate tickets" or "locates." This was an area in which the utility felt GIS could make the greatest impact. 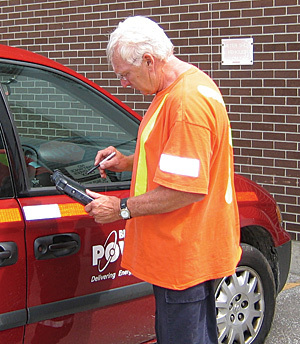 Bluewater Power had been operating like most utilities, receiving locate requests from Ontario One-Call, then printing, sorting, and taking them to the field as paper records. The sheer volume of printing and sorting paper tickets was a daunting task and consumed many internal resources. Bluewater Power looked for an alternate means to manage this problem and streamline the process. Reduce internal operational costs by at least 60 percent. Be more efficient in processing each ticket request, which would increase the contractor's efficiency. Reduce the lag time for the waiting customer who filed the original dig request. Maintain an official archive for all received and processed locates. Bluewater Power locator Bob Burges. A solution was needed that would plug right into the enterprise database without the need for customization or major changes to the data. At an Esri user group meeting in 2005, Ena Forbes, GIS administrator for the utility, learned of Dig-Smart, LLC, an Esri Business Partner located in Buffalo, New York. Once the decision was made to move ahead, the installation of the Dig-Smart software was completed within a day. "With a few minor TCP/IP changes, we were receiving locates right though our GIS. It is exactly what we were looking for," says Forbes. The implementation of both the Dig-Smart Enterprise and Field modules has streamlined the utility's processes considerably. "We wanted to avoid having to print and physically handle each locate," says Forbes. "The process we had in place was cumbersome. Each day our field personnel would report to the office, pick up their stack of tickets, and spend time sorting them before heading out. At the end of the day, when they returned, the completed locates would be sent to the customer and handed off to office staff, who would enter them into a database. It took a lot of time to manage the paper system. By moving to an electronic solution, our locators can focus on what they do bestperforming locates." As part of the process of changing this workflow from paper-based to electronic, a tablet PC was purchased for the vehicles. As each day begins, tickets are received electronically from Ontario One-Call and opened with ArcInfo, where the location is quickly verified and a PDF document created. Instead of taking a stack of paper locates to the truck, field personnel now connect to the database and download all of the locates that have been mapped and analyzed using ArcInfo. Upon "checking out" the active queue from the database, a map of the site, along with the original ticket, is embedded into the record. This gives field personnel the ability to view the entire geographic area along with the original request from the customer. Finally, using the stylus on the tablet, field personnel use drop-down menus to record the decisions made at each locate site, such as "This site has been analyzed and located by Bluewater Power." After completing the daily ticket queue on the tablet, field personnel reconnect to the database and post their comments/results. Again using ArcInfo, each ticket is finalized with the response, then e-mailed or faxed to the customer and archived by date and ticket number. "At first, the change in workflow seemed a bit daunting," says Randy Hull, operations manager for Bluewater Power. "We were a little unsure about using all this technology, but I have to admit I can't imagine going back to paper." Training was done on-site, and although there was some apprehension about moving personnel from the paper-based process to using GIS, the worry was unnecessary. Long-term personnel were using the electronic system within days. Both systems were run concurrently for about a week and the intention was to go a little longer, but at the suggestion of the field personnel, the paper system was abandoned completely before the set deadline. "I was pleasantly surprised that the field personnel took to it so easily," says Forbes. "I expected that we would have quite a learning curve, but the software is intuitive and easy to use." 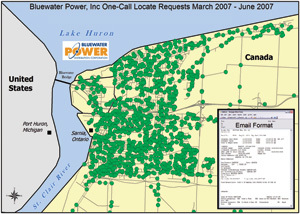 Bluewater Power has been successfully using the GIS-centric approach for managing locate requests since February 2007. The improvements and savings forecasted have been realized. For more information, contact Ena Forbes, GIS administrator, Bluewater Power (tel. : 519-337-8201, extension 282; e-mail: eforbes@bluewaterpower.com), or Jim Schoenberg, president, Dig-Smart, LLC (tel. : 716-435-8573, e-mail: jschoenberg@dig-smart.com).